Today we look at a few ideas and suggested destinations when planning your self drive rental itinerary from Perth. Perth Self Drive Rental campervans and four wheel drives are a fantastic way to see Australia – and although a long holiday allows for more destinations, a shorter self-drive itinerary can be amazing too! When choosing destinations from Perth, you really are spoilt for choice. If you have only a few days, you can stay in-and-around Perth and still enjoy a satisfying holiday with many experiences. The Swan Valley for example is a mere 20-30 minutes drive from Perth, yet allows you explore stunning wineries, a chocolate factory, animal farms, nature trails and much more. Further North, you can travel through the historical town of New Norcia, before heading further North to see the Pinnacles – and all this can be done in less than one day’s drive if you’re pressed for time. A few days is also enough time to explore Perth’s southern regions, including Fremantle, Busselton, Yallingup and Margaret River. You might even consider including a trip to Rottnest Island, a quick ferry ride from Fremantle. If you’re lucky enough to have more time on your hands, you can create a self drive rental itinerary from Perth that takes you right to the top of Western Australia, all the way to Broome and beyond, in the Kimberley region. Alternatively, you can go South. Take the full tour of our gorgeous South West, including Margaret River, Augusta, Denmark and Albany. You can even head inland to the Kalgoorlie mining town. No matter whether you choose to head North or South, we recommend spending maximum time at each location, rather than racing from stop to stop. Although some travelers try to cram as many destinations as possible into their time frame, this can make your holiday stressful. Instead, allow yourself time to relax and soak up the atmosphere of each new place. The beauty of self-driving is that you’re free to leave when you’re ready. You’re not glued to your next hotel booking! Many visitors from Europe come to Australia during the European Summer holidays, typically from July to September. This is Australia’s Winter and, although Perth’s Winter is very mild, there can be many cold, rainy days. If you’re seeking a warm holiday during this time, it’s best to make sure your self drive rental itinerary goes North to Broome and the Kimberley region. North Western Australia stays warm during July-September, so you can still enjoy a swim at the beach and soak up the sunshine. If your self drive holiday is during Australia’s Summer months (December-February), then a South-West journey is highly recommended. Our South West is much cooler than Perth. While Perth in mid-summer might reach a scorching 40 degrees Celsius, our South West will often be ten or more degrees cooler on the same day. You’ll still enjoy warm summer days and beach weather, but the heat won’t be so oppressive. 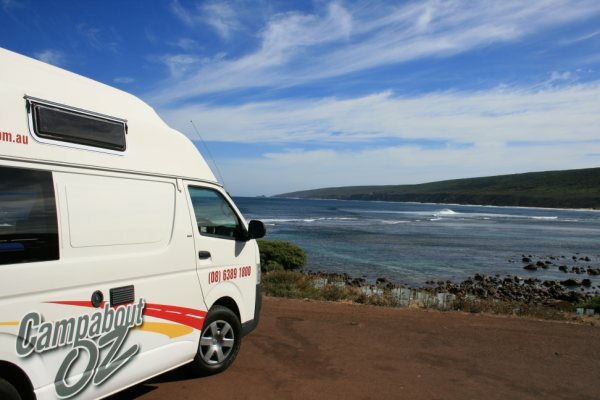 At Campabout Oz, we offer camper vans for travelling on sealed roads, camper trailers which are perfect for families and groups and four wheel drives for off road adventure. Give our office a call, or use our easy contact form, to discover the best vehicle for your Perth-based itinerary. Remember, we have depots for pick up and drop off all over Australia, so talk to us today about your holiday plans.